The Office of Sheriff was the first county office established in the Americas and records show the first Sheriff was selected in the Colony of Virginia in 1634. Thomas Jefferson wrote of the importance of the Sheriff in his treatise, The Value of Constitutions; "The office of the Sheriff is the most important of all the executive offices of the county... there is no honorable law enforcement authority in the Anglo-American law so ancient as that of the county sheriff whose role as peace officer goes back at least to the time of Alfred the Great." The Sheriff is a constitutional officer and offers the people in his jurisdiction the most effective liaison to law enforcement. When citizens have a complaint concerning an issue in their county the Sheriff is ultimately their best remedy. Although modern times have placed more glamorous attention on police departments and state law enforcement agencies, in reality they create a myriad of problems. The Sheriff can respond faster to a citizen's complaint than any police department, as his fast and efficient abilities for handling these concerns are derived directly from his constitutional foundation, while other types of agencies continue to struggle with their bureaucratic red tape. Independence and self-governance is critically important to this office, as it lends itself to an autonomous nature greater than all other appointed law enforcement officials. The Sheriff answers directly to the people, rather than to other government officials. As an elected official the Sheriff can be a social force in the community and can represent the public's will on issues of community importance. "One voice one vote" provides for individual participation in the selection of the Sheriff and the Sheriff can point to the fact that if the public isn't satisfied with the job he is doing that he can be voted out of office. Throughout American history many colorful individuals have held the office, to include George Washington's father, Augustine, (Sheriff of Westmoreland County in Colonial Virginia), "Wild Bill" Hickok, Wyatt Earp, Bat Masterson, Pat Garrett and Bill Tilghman. President Theodore Roosevelt served as a Deputy Sheriff in the Dakota Territories and President Grover Cleveland is the only President known to have personally hanged a man...while serving as the Sheriff of Erie County New York! 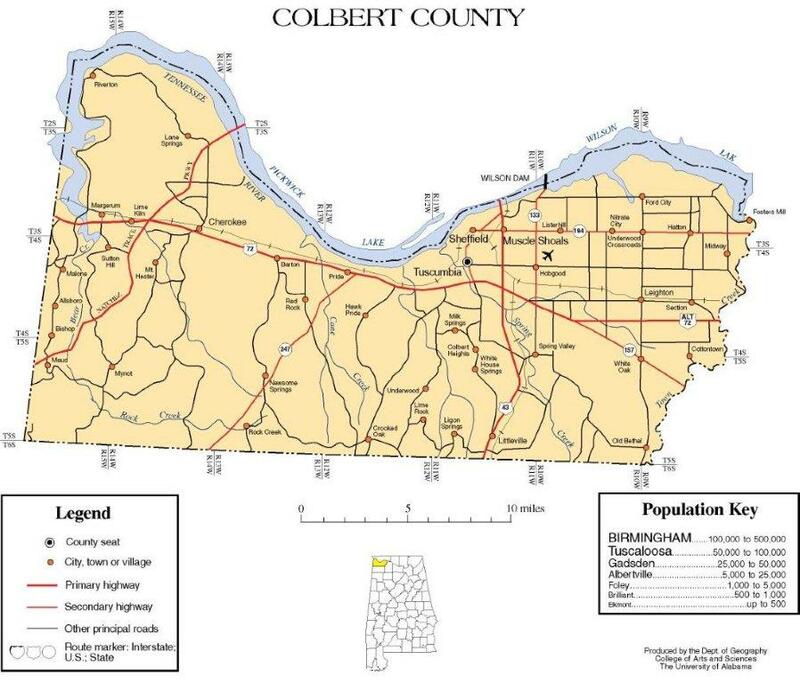 Colbert County was originally settled as early as 1810 and was part of Franklin County. The County was created by the Alabama Legislature on February 6, 1867. A Constitutional Convention abolished the county on November 29, 1867 and then on February 24, 1870, the Legislature once again re-established Colbert County. William Reese Julian served as a Captain during the Civil War and became the first elected Sheriff of Colbert County in 1870 after the close of the war. Twenty six (26) individuals have served as Sheriff of the county. After over a year of research, those listed below are believed to be an accurate list of all who have officially served as Sheriff of Colbert County. If you have knowledge of a sheriff and/or a picture and biographical information, it would be greatly appreciated if you would email your information to rjcmay@gmail.com. Each name that is underlined can be clicked on to read more about that Sheriff and his history.